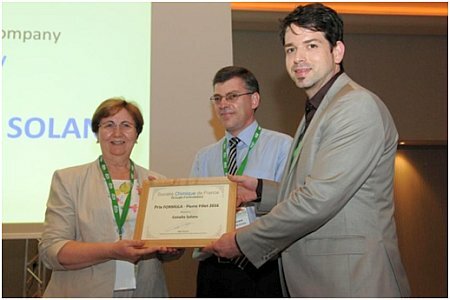 Conxita Solans, Scientific Director of the Unit 12 NANBIOSIS, received last July 4 in the opening ceremony of the congress Formula VIII, the award Pierre Fillet 2016, given by the Formulation Group of the French Chemical Society (SCF). The prize was awarded to Dr Solans in recognition to her contributions on formulation of colloidal systems, namely on the design and characterization of Nanostructured Liquids such as nano-emulsions, microemulsions, micelles, etc, developed through Unit 12 of NANBIOSIS. Pierre Fillet was a major force behind formulation in France particularly and across Europe, he was one of the instigators of the first Formula conference held in Nice in 1987. The prize is awarded to a well-recognized researcher whose work led to significant developments of any topic in formulation.